Hot-melt extrusion (HME) - melting a substance and forcing it through an orifice under controlled conditions to form a new material - is an emerging processing technology in the pharmaceutical industry for the preparation of various dosage forms and drug delivery systems, for example granules and sustained release tablets. 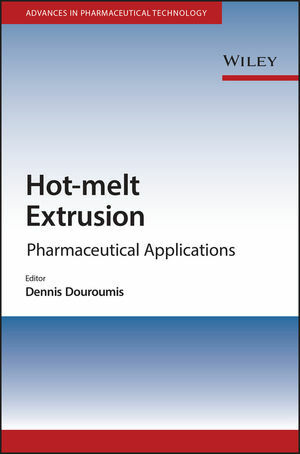 Hot-Melt Extrusion: Pharmaceutical Applications is an essential multidisciplinary guide to the emerging pharmaceutical uses of this processing technology for researchers in academia and industry working in drug formulation and delivery, pharmaceutical engineering and processing, and polymers and materials science. This is the first book from our brand new series Advances in Pharmaceutical Technology. Find out more about the series here. After completing his postgraduate studies Dr Douroumis worked as a postdoctoral fellow at the Friedrich – Schiller University of Jena in the Department of Pharmacy, and later as a Senior Scientist at Phoqus Pharmaceutical plc, tasked with the development of sustained/pulsatile release formulations, orally disintegrating tablets and taste masking of bitter drugs; some of these studies were in collaboration with Evonik GmbH in Darmstadt, Germany. He is currently Senior Lecture at the in the University of Greenwich School of Science where he coordinates the course for the MSc Pharmaceutical Science Programme (350 students per annum) and is also a tutor for undergraduate studies in Pharmaceutical Sciences.